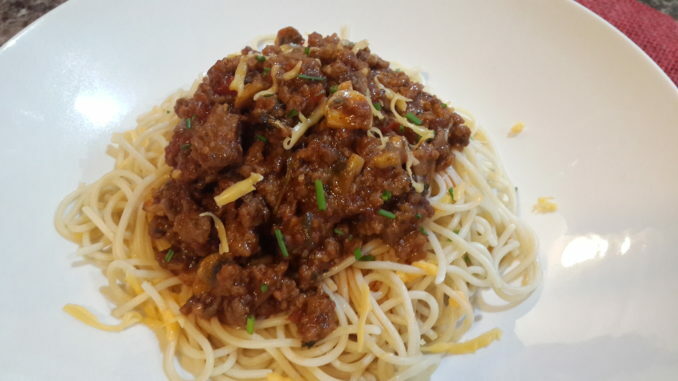 One can never go wrong with minced beef and pasta, especially if you are able to spice it up with all kind of different flavors. This dish can be a real delight when you have an unplanned hosting night such as: when your girls call you last minute wanting to stop by for a girls night in, which includes Food! Or when the hubby sends a text message, 30 minutes after you have arrived home, to let you know he was on his way home…. with TWO extra dinner guests! These scenarios have happened to me, so I make sure to keep minced beef, spaghetti and mushrooms on hand, turning an unplanned hosting event to a delightful and stress free evening with friends and family! Heat oil in a non-stick pan on high. Brown the minced beef for about 5-6 minutes, breaking up any lumps with the back of the spoon as it cooks. Add mushrooms and cook for 4 to 5 minutes, stirring until all mushrooms are tender. Season with thyme and garlic and herb spice. Meanwhile, cook the spaghetti according to packaging, drain and transfer into a casserole dish. Sprinkle a bit of the grated cheese on the pasta and microwave for 2 minutes or so (best if done just before serving). Top the past with minced beef. Sprinkle with a little-grated gouda cheese and chopped chives.